Clare legend Jamesie O'Connor runs the rule over the eight contenders to life the Liam MacCarthy this August. Five years now since Clare were All-Ireland champions, and if the bookies are to be believed, that’s not remotely close to changing in 2018. Paddy Power rank them fifth and last in the betting for the Munster championship, and some knowledgeable hurling people within the county are genuinely concerned they mightn’t win a match given how competitive the province is likely to be. The contrary view is that if they win in Cork next Sunday, anything is possible. Defensively, I’m not convinced they’re good enough. Question marks surround the full-back line and the switch during the league of Conor Cleary to number three with David McInerney going to centre-back may have to be reversed. Cian Dillon’s return will help, but there doesn’t appear to be a great deal of depth in the panel and up front, both Aron Shanagher and Aaron Cunningham will be missed. With Podge Collins struggling to find the form of 2013, much will rest on Shane O’Donnell and Conor McGrath, along with Tony Kelly and Colm Galvin in the middle of the field. Everyone appears to be writing them off, but they could have beaten the Rebels in last year’s Munster final and, with a core of really good players, they’re not without hope. Their schedule, games in the first two weeks followed by a week off, means they should be fresh meeting a Tipp side playing their fourth game in 22 days, and who at that stage might even have qualified for the final. Outsiders, but don’t rule them out completely. The defending Munster champions had a disappointing league, but John Meyler rotated his squad, looks to have found a couple of players, and Cork are always likely to be a better top-of-the-ground team anyway. The younger players who at times lit up last year’s championship — Mark Coleman, Darragh Fitzgibbon, Alan Cadogan et al — are a year older, stronger and wiser. Eoin Cadogan’s return gives them more options at the back, and both Sean O’Donoghue and Tim O’Mahony looked like they had the tools to become championship starters as well. If they rediscover the swagger they displayed while winning Munster in 2017 and kick on from it, they’re definite All-Ireland contenders. But, but, but . . . nagging doubts remain. They should be good enough to get out of Munster, but do they have the required steel and hard edge needed to go all the way? They’ve yet to demonstrate that they can win ugly and until they prove otherwise, Tipp, Waterford, Kilkenny and Galway will believe that Cork can be outfought in a battle. They need to beat Clare next weekend, and face a crucial round-three tie at home to Limerick, just six days after the Tipp match. That’s not going to be easy, and that week could determine their fate. In a good place after a hugely positive league — promotion out of 1B, character-building wins over Galway and Clare, where they really dug deep — and a side no-one in Munster will fancy playing. Tipp and Waterford both travel to the Gaelic Grounds, where Waterford in particular have a poor record, and they have the advantage of the week off before facing Cork in Páirc Uí Chaoimh in round three. They have a squad, a lot of good young players, who’ve cut their teeth in the Fitzgibbon with UL, LIT and Mary I, and in Paul Kinnerk, a proven top-class coach. Not having Diarmuid Byrnes hurt them last year, but he’s back and playing well. Cian Lynch also looks back to his best after a disappointing 2017, and all three relative newcomers who started in the full-forward line against Clare in the quarter-final — Aaron Gillane, Seamus Flanagan and Barry Murphy — had their moments during the league. The return of the Na Piarsaigh contingent strengthens them further. On the negative side, full-back remains an issue and they can’t afford to be as wasteful in possession as in the past, considering how small the margins are likely to be. They will have to prove they have enough genuine top-class players to win the really big matches, but they’re a coming force and dangerous opponents. Joint favourites for the All-Ireland and, at their best with a full panel to pick from, arguably the team they all have to beat. But are they better than they were in 2016 or even last year? I’m not sure they are, and the schedule in Munster — four games in 22 days — is a punishing one. It’s inconceivable, with two wins required, that they won’t be in the top three, so worse-case scenario, they make it to a quarter-final. But, after the defeat in the final to Kilkenny, any veneer of invincibility after some of their earlier league performances has definitely worn off. In the absence of Seamus Callanan, Jason Forde was a revelation up front during the league, and if he can carry that form into the summer, it’ll be a major fillip. Assuming they get Callanan, ‘Bubbles’ O’Dwyer, ‘Bonner’ Maher, Noel McGrath and Dan McCormack all fit and back on the field, they obviously become a different proposition. Defensively though, there are holes. Have they enough pace at the back? In particular, can James Barry regain his confidence and do a job for them at full-back? Throw in a new and inexperienced goalkeeper, and it’s clear there are legitimate question marks heading into what could be a torrid test in Limerick next Sunday. Like Tipp, four matches in 22 days over four consecutive weekends is not ideal. That’s the first disadvantage. Cork having a rest week before what could be their crucial final day clash magnifies it. Unlike Tipp, none of those four matches will be at home, with Walsh Park not yet ready. That’s the second, arguably bigger disadvantage, and Waterford supporters will rack up more miles this summer than any of their contemporaries, with trips to Ennis and to Limerick twice. The Gaelic Grounds, where they have a terrible record, is their designated home venue for the clash with Tipp. On the field, Tom Devine’s return will help offset the loss of Shane Bennett, but essentially it looks like Derek McGrath will be selecting from the same panel of players that got to last year’s final. There were signs this spring that Patrick Curran, after a disappointing 2017, might be closer to the player Waterford need him to be, which would be a huge positive. Whether ‘Brick’ Walsh and Kevin Moran can go to the well one more time and repeat the heroics of last year has to be a concern. They deserve to be respected and only a fool would write them off. The fact that it may be McGrath’s last year is an added factor. I think they’ll make it out of Munster. Therey are as well placed as any side in recent years to retain the title, but history shows how difficult that task has been for all bar Kilkenny. The strong and experienced spine of the team, from Daithí Burke, through Gearóid McInerney at the back, David Burke and Johnny Coen at midfield, to Joe Canning and Conor Cooney in the central attacking positions, picks itself. Jason Flynn and Niall Burke only came off the bench in last September’s final, so there are options up front and with Johnny Glynn committing to stay home for the entire summer, if anything they’ll arguably be stronger in attack. Defensively, they don’t have the same strength in depth, but they’re not the only county with that issue. They face a crucial six days, with Kilkenny coming to Pearse Stadium on Sunday, May 27 followed by a trip to Wexford Park the following Saturday. I don’t see them going undefeated, but I don’t see them not making the Leinster final either. They might need to suffer a setback in the province to get the impetus needed to go all the way. If that’s the way it plays out, I think they’ll recover to be champions. League champions, and once more things look very positive in Kilkenny. The move of Cillian Buckley to centre-back, along with TJ Reid’s return to lead the attack, is now the axis around which this team will revolve. 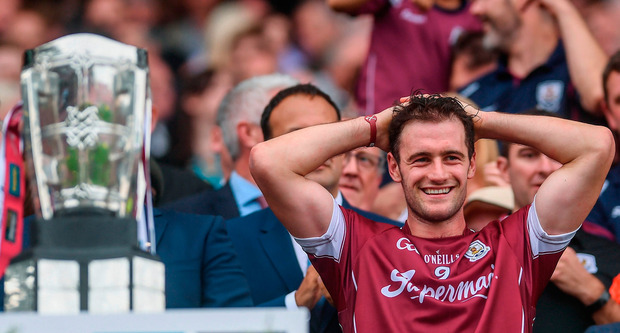 Walter Walsh had an excellent spring, Ger Aylward looks back to the form he had in 2015 and apart from the young guns such as Martin Keoghan who the league threw up, they have Richie Hogan, Colin Fennelly and Paul Murphy all to come back as well. With Conor Fogarty now also fully healthy, they have a strong core of experienced players who know how to win All-Irelands. Irrespective of what happens in Salthill, I don’t see them losing to Wexford in Nowlan Park and assuming that they take care of business against Dublin and Offaly, they’ll be in the Leinster final. If there are negatives, while Pádraig Walsh is a top class player, I’m still not convinced about him at full-back, and if teams man-mark Reid, as Wexford in particular are likely to do, is there enough firepower in attack to carry the scoring burden if he’s curtailed? Time will tell. Last four? Yes. Champions? No. Beating Kilkenny in both the league and championship, a Leinster final appearance and promotion to the top tier constituted a very good first year’s work for Davy in 2017. Nonetheless, the gap between themselves and Galway in the Leinster final, and Waterford in the All-Ireland quarter-final can’t be ignored. The positive is that, akin to when he took over in Clare, the young players who are coming through may very well be upgrades on the ones they’re being brought in to replace. So it’s fair to assume they’ll be better in 2018. Rory O’Connor showed flashes during the league of what he’s capable of; David Dunne was a big loss last year — he’s back, as is Damien Reck and while I’m not sure if there’s any chance of Liam óg McGovern featuring this summer, the attack should still carry more pace and menace than a year ago. On the downside, they could obviously have done with a fit, focused and committed Jack Guiney. There’s also the fact that, while Offaly and Dublin might fear Kilkenny and Galway, they don’t fear Wexford. Both Pat Gilroy and Kevin Martin will surely have targeted the Wexford match and with an expectant public and all the pressure on Davy’s side, they’re going to have to be ready to go from round one.